The tC Release Series 2.0 (tC R.S. 2.0), hit dealers in mid-April 2006. With a special grille, blue paint, and 17-inch wheels, the RS2 came with front and side airbags, a suede-like material on the seats, and a powerful Pioneer audio system with iPod jack, along with a numbered plaque. Only 2,600 were made, at $16,300 each. The tC Release Series 3.0 was shown in Detroit in January 2007, for sale in February 2007. Sold in white, they have a front and rear KenStyle® ground effects kit, darkened headlights, and a wideer upper grille with a honeycomb pattern, along with LED tail-lights with clear trim. The tC R.S. 3.0 has black Alcantara® seats detailed with a gray perforated center seating surface on a white background and a Blizzard Pearl RAZO® weighted shift knob with black leather insert. The 160 watt Pioneer stereo includes a 35 watt subwoofer. Each of the 2,500 Release 3.0 Scions will have a numbered plaque; they will sell for $2,580 over the base price. The Scion tC is, in many ways, the reincarnation of the Toyota Celica, a sporty two-door version of the venerable and practical Corolla. As the Corolla got more formal, the Celica got sportier in appearance, but its weight and slow increases in horsepower worked against it as more challengers offered high speed in comfortable packages. 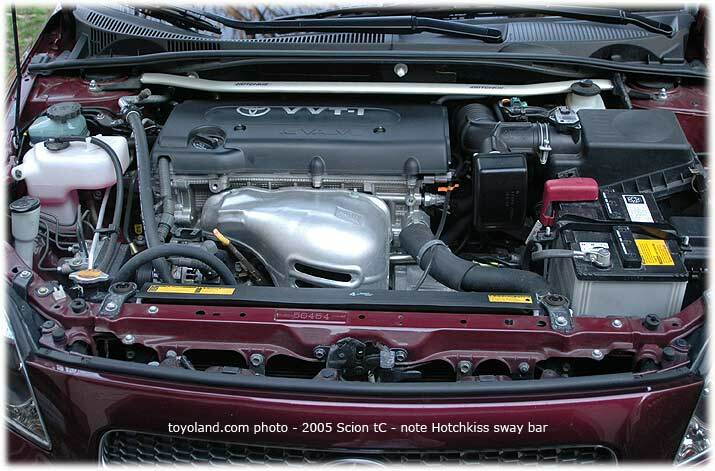 The tC is powered by a 2.4 liter engine with intelligent variable-valve technology and dual cams; it has a good deal of torque from just above idle all the way up to a rather high redline, and the 160 horsepower rating doesn't convey the way that power is always ready, making it feel more potent in everyday use than the Matrix XRS which is stronger on paper. The optional TRD muffler makes it feel even more muscular, with an ever-present low growl that brings up images of Camaro V8s. Acceleration (with the stick) is measured at about 7.8 seconds zero-to-sixty, which is, amusingly, identical to the original 1995 Neons; it is slower than the Corolla XRS, despite the considerably larger engine, because of substantial added weight. However, again, the instant-on acceleration provides a thrill, convenience, and safety measure that should be weighed against any simple sprint comparisons. In-gear acceleration is very good for this price class. That comes at the expense of gas mileage, which is 22 city, 29 highway (EPA). Two five-speed transmissions are available, one manual and one automatic; with a nice wide torque range, six speeds aren't missed. The suspension is designed for sportiness, with a front and rear double wishbone design, while the standard P215/45R17 all-season tires promise good grip and a firm, sporty ride. Since we do not live in the mid-1960s, braking is not ignored; the tC has standard four-wheel antilock brakes with electronic brake distribution. Safety of the little car is enhanced with dual front airbags and a driver knee airbag, while side and overhead curtain airbags are an extra $650 (cheaper than ABS used to be just a few years ago). Cornering is a mixed bag, due partly to the tires. While the tC sometimes feels as though it is on rails, handling as well as considerably more expensive sporty cars, even those incredibly low-profile tires have a marked tendency to squeal (we've noticed that in other Bridgestone Potenzas), and sometimes the tC feels a bit heavy and prone to body roll - not surprising given its weight. Launching without embarassing tire chirp or squeal can be hard unless you start slowly, and smooth launches are somewhat more difficult than usual; both can be laid at the doorstep of good torque, a low first gear, and the squeal-prone tires. Overall, the tC does not seem like a true performance chassis, but it does quite well most of the time. There are optional tires which we'd generally recommend. Ride is firm but not uncomfortable, with serious bumps being smoothed out and not too much busy-ness over rough streets. Despite the low-profile tires, the tC is good at preventing major bumps and road problems from shocking passengers. The subsonic booms made by many cars over bumps are pleasantly absent from the tC. The tC seems to be aimed pretty solidly at younger buyers, with a Celica-style sporty interior and two big doors. Once you get into the back, there's a decent amount of room, and in front, the seats are higher than the last Celica, so the "driving out of a bathtub’ feeling is no longer an issue. Still, reclining is the order of the day; the Scion is as far from the Corolla and Scion xB as the Celica was. (Indeed, they are made on completely different platforms and with different engines, but the overall feel is surprisingly similar.) More to the point, the tC's standard stereo is a Pioneer unit with 160 watts, 6 speakers, and sound processing, hidden underneath a cool silver panel. Our test car had a $59 shift knob by OBX and a $525 TRD exhaust that made a Camaro-like growl every time we hit the gas, but was not annoying at speed. Turn signals mounted in the side mirrors and dual sunroofs for front and rear drivers round out the package. The interior, while fairly attractive (albeit dark in our black model), has cheap-looking aspects, and while it looks well-assembled, our test car, with 11,000 miles, had a surprising number of buzzes and rattles coming from different directions. The Pioneer stereo is surprisingly hard to use; the folder navigation options are good for MP3 CDs, but any driver who uses those while in motion will probably look as though they're in a heated cellphone argument. There are no knobs at all, making quick adjustments difficult, and the buttons don't have an immediate feel; they also tend to be quite small, including the power button, situated inconveniently at the far end of the unit. Changing bass and treble is down by pressing a tiny Audio key (marked with an A) and then using the volume up/down buttons. 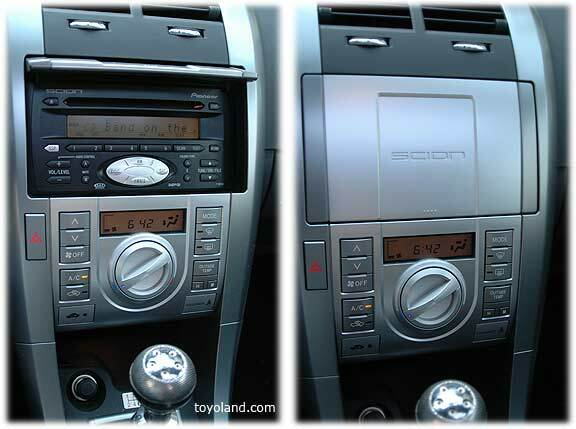 Sound is good, though not exceptional; satellite radio is integrated into the base unit. The climate control is centered around a large, smoothly moving temperature knob whose indicator light gradually moves from red to blue as you go from hot to cold. The rest of it uses buttons, with a separate a/c button. That means you can't go "in between" modes, but the system is so well designed most people won't want to; there aren't any drafts, and the fan is surprisingly quiet. The instrument panel itself uses silvered, grained gauges with amber backlighting that preserves night vision. The usual complement of gauges are in the usual places: temparature, fuel (1/1, 1/2, R), speedometer, tachometer. Warning lights are in blackened areas underneath the gauges. Contrast could be better; the silver is designed to reflect ambient light to make the black lettering stand out more, but the gauges are well hooded, so there's not much ambient light for them to catch. The effect is striking at night, though, with slight echoes of the bright needles from the reflecting surfaces. The speedometer goes up to 140 mph, but the commonly active part (0-80) is large enough that the optimistic scale isn't an issue. Controls are generally placed intelligently and conservatively, and the cruise control is Toyota's usual extra stalk that moves with the wheel and allows for easy bump-up, bump-down, and cancelling; but you do have to active cruise each time you restart the car. Seat controls are manual, with a knob for changing bottom seat tilt, a lever to pump the seat up or down, and another lever for the recline. The usual Toyota gas cap cover release is in the usual place on the floor by the door, but the hatch doesn't have a remote opener; it unlocks with the doors and has a hand-operated latch. Speaking of locking, the standard in-key remote is nicely designed, using a smaller key fob and a more attractive color-scheme than many similar systems. Indeed, the Scion tC's key fob looks much more attractive than the Lexus LX470's key fob, which is a uniform black (both have the alarm buttons built in). The side mirrors with integrated turn signals work nicely and are good-looking, but you can't see the signals going when you're in the car - they face forward. That's not a big deal, to be fair. We liked the standard power windows, with express up and down - a single press gets them all the way up or all the way down. The sunroof (also standard!) has a vent position in addition to open and closed, and has express open and close as well; the sun blocker has a vent built in, so you can leave the sun blocker all the way shut and air can still get out of the sunroof. The dual sunroof is quite nice, providing two separate covers; with both open, the Scion tC feels very open to rear seat passengers, who also sit beneath the hatch glass. The covers (sun shields) are not the traditional fabric-covering-cardboard variety, but are more like window shades mounted sideways; the fabric rolls up in a clever space-conserving move. The only drawback to this system, which is implemented very well in feel and usability, is that you can't have them partly open; it's all or nothing. While it is a two-door, the tC is not an impractical vehicle designed to torture rear-seat passengers. Seat belts are arranged so they do not block the entrance to the back; rear seating space is generous, with decent headroom; rear seat passengers get their own dome light with a separate control; and the two front seats both have position memory, so that the driver (or front passenger) does not have to fiddle for a few minutes each time they move the seat forward to let someone in or out of the back. Our only rear-seat grip is the difficulty of using the LATCH child-seat connectors, but we suspect most people with kids of car-seat age will opt for another two doors (xB, anyone?). Cost-cutting is reserved to certain areas, and it's often clear which those are. The seat fabric is a textured black cloth, the sun visors do not have vanity lamps (they do have covered mirrors), the interior materials are various black and silver plastics, and the spare tire cover is a single big cardboard piece so that getting the spare tire out requires removal of everything from the cargo area. Normally we'd say that doesn't matter much any more since people hardly ever get flats, but with 45-profile tires, it may be another story - or not. There wasn't much wind noise, but the air had the feeling you get when a window is open - that is, the pressure seemed to buffet up and down, indicating something was open to the wind even when the windows and sunroof were sealed shut. Under the hood, everything is neat and clean, with plenty of spare room for whatever purpose (supercharger?) and fluid locations clearly marked. Our 11,000 mile car had an immaculate engine. Interior space is generous for this type of car, and, indeed, the interior would be nicely sized even for a four-door sedan. 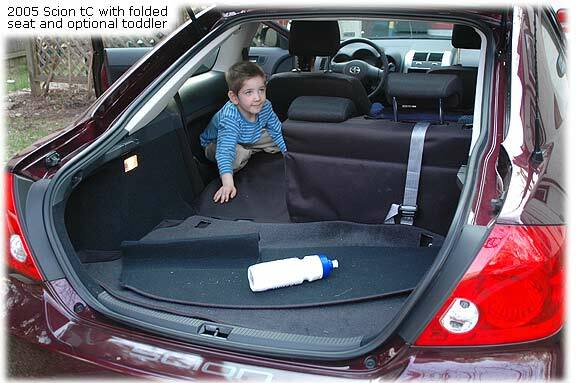 Cargo space is somewhat limited, though very convenient; the "hidden hatchback" design provides a large, flat area, and how much you can put into it depends on the shape of your cargo. Underneath a large cardboard cover is the spare, jack, and a little extra storage space, all in neat cushioning foam that makes it easy to pack everything back in again. Longer objects are easily accommodated by lowering one or both of the rear seats; the fabric is designed to work with this arrangement. 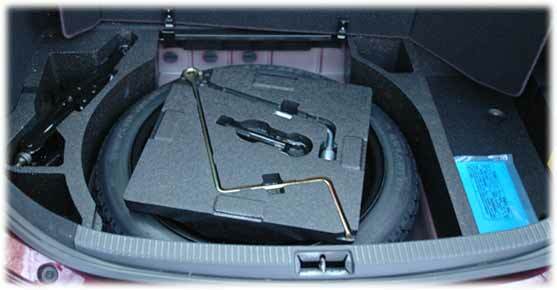 Most hatchbacks have some sort of cover to prevent thieves from seeing valuables in the cargo bay. These generally fall into two categories: a piece of carpet-covered cardboard, usually attached to the hatch door so it rises when the door is lifted; and a window shade-like retracting fabric cover. Scion has eschewed both of these, using instead loose fabric covers that are manually attached to the backs of the back-seat headrests. The system works, though it isn't as convenient as the conventional methods; it is a little more flexible, admittedly. The glove compartment also provides quite a bit of usable space (and the tire pressure monitor set button), and a dual-level covered center console between the front seats is a good place for smaller objects (top level) and CDs and such (bottom level). An extra cubby underneath the climate control is just slightly too small for most CD cases, though putting CDs into paper sleaves solves that problem. Front cupholders are deep cutouts, crude but effective, with a gap between for sunglasses and such. Rear-seat dwellers get similar cupholders in the side of the car along with small storage bays. Our test car was a reasonable $16,465 with destination, but Toyota loaded it up with some good options and some questionable features. The base tC comes nicely loaded, with air conditioning, the Pioneer stereo, four-wheel antilock brakes, low-profile tires and big alloy wheels, variable wipers, rear wipers, power locks and windows, remote, dual moonroof, rear defogger, cruise, tilt wheel, and such; but our test vehicle had the side and overhead airbags ($650), carpets ($145), cargo liner ($104), rear bumper protector ($58), OBX shift knob ($59), TRD exhaust ($525), and front strut tie bar ($225). The final price ended up being $18,231, though you can spend less ($16,465) or much more ($25,000 with all options, we understand, not that anyone would do that!). The Scion feels better than the Acura RSX, Ford Focus SVT, and some other cars in this price class (and the one above), and it comes with two doors, if that's something you really want. It should also come with Toyota quality - the Echo which lent its basic chassis was one of the best-built cars available, according to quality surveys. Overall, the Scion tC is an interesting mix. Clearly designed to appeal to younger buyers, it provides a rare reasonably-priced two door coupe with sporty looks, a nicely balanced 2.4 liter engine that gives good go-power without needing to be revved to absurd levels, a nice mix of cornering and ride, a bunch of standard features - some esoteric and some not - and enough cargo and rear seat room to be called practical. Those looking for uncompromised performance, albeit at a higher price, may be interested in the Dodge SRT-4, Subaru WRX, or Mustang, but all three are over the base price of the Scion tC, whose price includes a large array of nice options. The tC is faster and more comfortable than the Toyota Celica, and, we think, a nicer all-around ride than the Acura RSX (which sells for a considerable premium) or Civic Si. As far as two-door sporty coupes go, it's a good deal and surprisingly easy to live with. That said, being closer to middle age than teen-age, if we were to look at Toyota and Scion cars in this price range, we'd probably opt for the Corolla XRS.